Different companies have different processes for cleaning your vents. Here at Dust Doctors, we use an air sweep method. This helps to prevent any dirt or dust from being blown from the vents into your home. 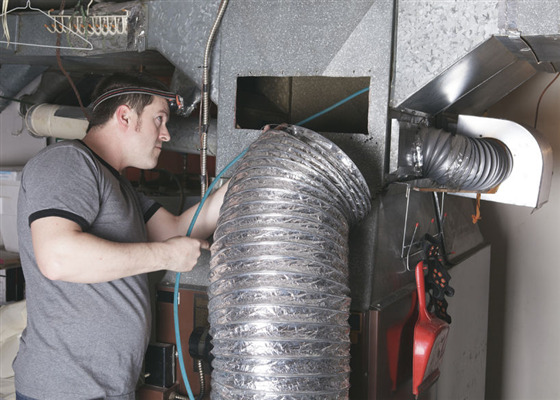 When the air sweep method is performed, we attach a hose to one end of the vent. This hose acts as a vacuum, sucking in dirt and dust that is blown into it. On the other end of the vent or air duct, we have a line that blows the air. As the air is fed through the line, it blows dirt and dust toward the vacuum line, where the dirt and dust is sucked away. The exact length of the process varies. The larger your home, the longer your ducts are and the more vents you have. The smaller your home, the fewer the vents and the shorter the ducts are. In general, you can expect the process to take about a couple of hours depending on the size of your home. The process is a fairly fast one that should not impact you while you are in your home. However, our crew will need access to your vents so be sure to have the area directly under your vents free and clear of furniture or clutter. When the vents are being cleaned, it will simply sound like a vacuum is running in your home. It will not be overly loud and should not disrupt your daily routine. When the vents are being cleaned, you can expect to have to turn off your heating or cooling unit. As such, if it is going to be warm outside, you may want to use a fan while the vents are being cleaned. If it is cold, a space heater may come in handy. Are you looking to have your air vents and ductwork cleaned in the greater Twin Cities, Minnesota area? Then contact Dust Doctors. We are committed to removing dust from your home and cleaning all of your vents. Contact our team today to schedule an appointment with us.